I was never a huge fan of pork. In fact I didn’t eat any pork products (except bacon) for years–even years before I ever became a vegetarian. I just didn’t like it. It’s growing on me though. In the past year with our journey to eating more REAL FOOD I’ve grown to enjoy eating pork again. It helps finding tasty recipes to try. Here are three ways we’ve done pork in the recent months. I’m always looking for new recipes to try, and if are interested you can see more recipes I’ve tried here. I saw this recipe and it was simple–which I like–and I almost have all the ingredients at all times. I used fresh basil from our garden and garlic I’d gotten at the Yakima fruit stands. Marinade for 30 minutes before grilling. There really is no such thing as “too much garlic” so I went a little nuts on mincing the garlic and tore up the fresh basil to marinade. I used the juice of one lime. 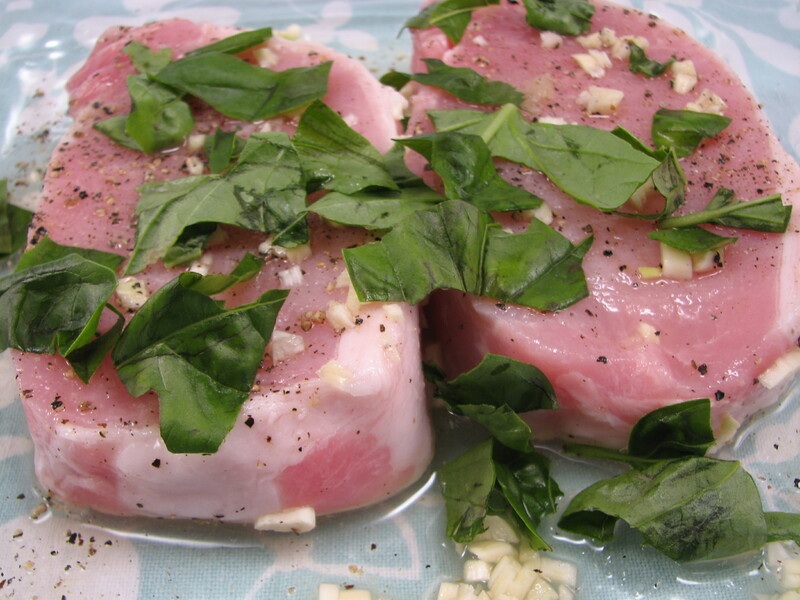 The “usual” way we do pork chops (boneless or bone in) is with a simple grilling seasoning. It’s meant for beef but it goes great on pork chops. Preparing the pork chops this way is both easy AND it means our side dish can be anything we want. 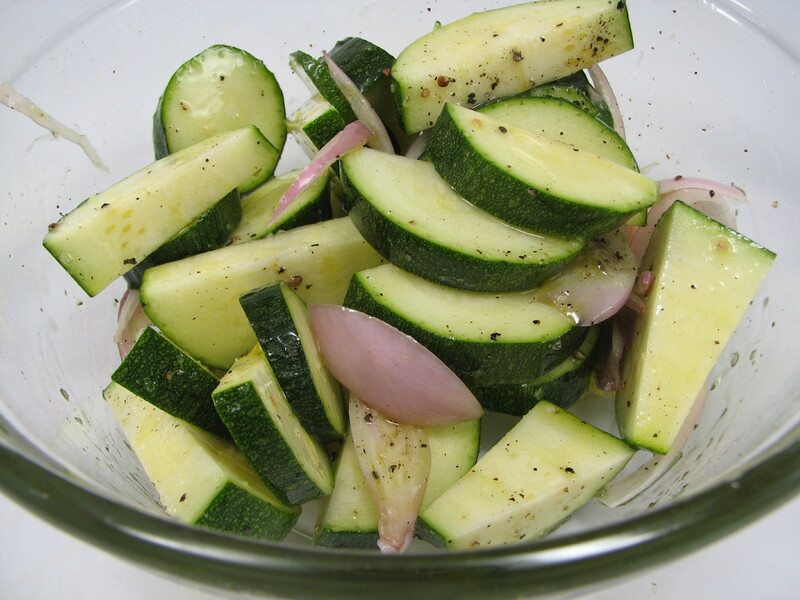 Everything goes well with a seasoning that’s basically salt and pepper–salad, grilled zucchini, steamed veggies–anything. I altered this recipe because we didn’t have asparagus but we had TONS of zucchini from the garden. Heat oven to 400° F. Heat 1 tablespoon of the oil in a large ovenproof skillet over medium-high heat. Season the pork with ¼ teaspoon each salt and pepper. Cook, turning, until browned, 5 to 6 minutes. 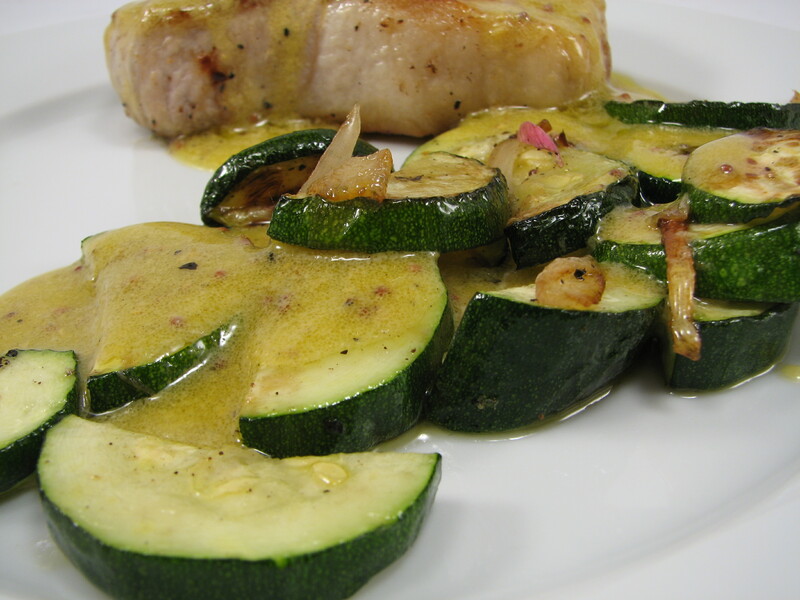 Transfer the skillet to oven and roast until the pork is cooked through, 12 to 15 minutes. Let rest for at least 5 minutes before slicing. Meanwhile, on a rimmed baking sheet, toss the asparagus and shallots with 1 tablespoon oil and ¼ teaspoon each salt and pepper. Arrange the vegetables in a single layer and roast, tossing once, until tender, 12 to 15 minutes. 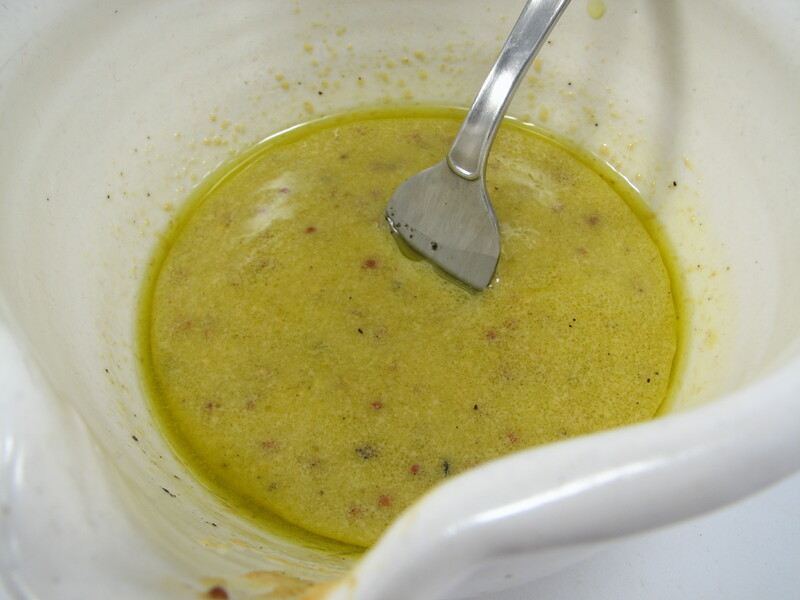 In a bowl, whisk together the vinegar, mustard, and remaining ⅓ cup of oil. 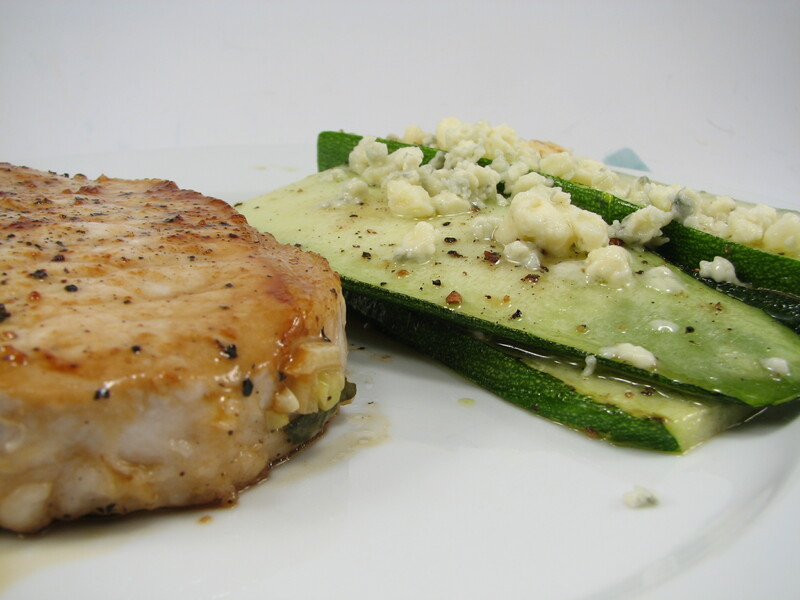 Serve the pork with the vegetables and drizzle with the vinaigrette. This recipe was okay. 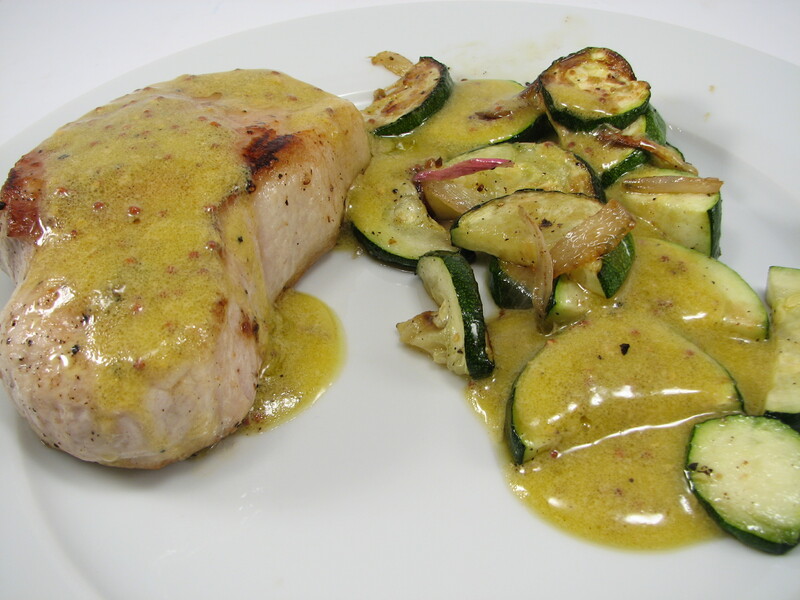 It wasn’t the best pork recipe we’ve tried but I enjoyed the tangy-ness of the mustard vinaigrette. 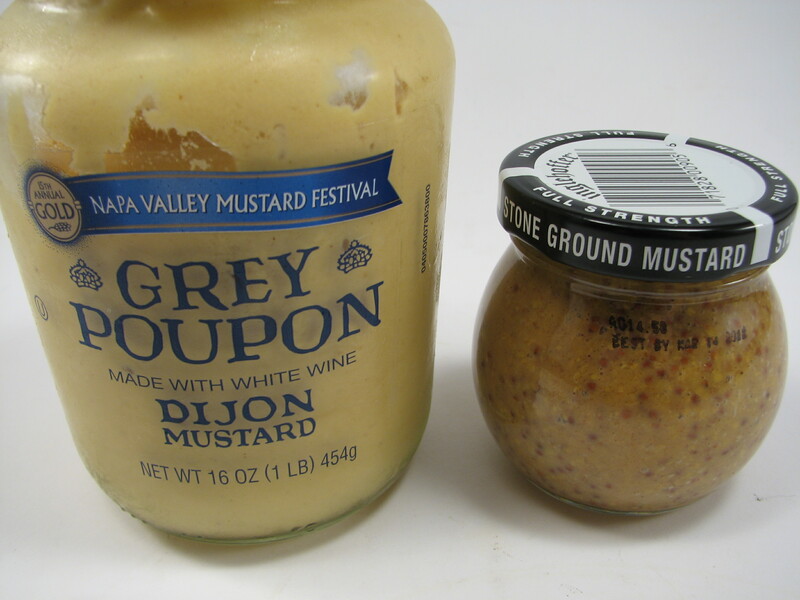 I mixed Dijon mustard with stone ground mustard. 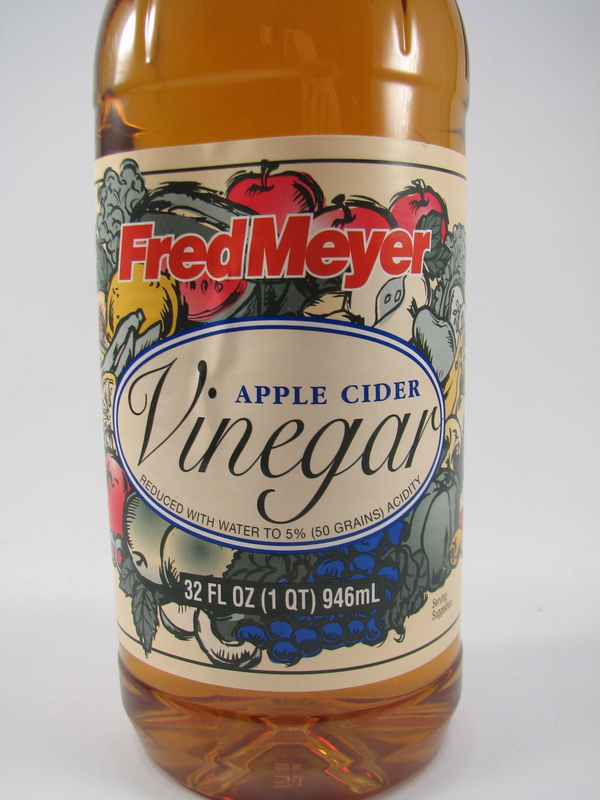 I was unsure if Apple Cider Vinegar is the same as cider vinegar–but a quick tweet on Twitter confirmed it was the same thing (and that I shouldn’t use red wine vinegar!). Instead of asparagus I chopped up fresh zucchini from the garden and half a shallot. I put them on a baking tray as instructed and baked them in the oven. I have to say, the combination of shallots and mustard vinaigrette is AMAZING. Loved the flavors! I want to find more recipes that call for shallots. Yum. I made us salads to go with dinner. 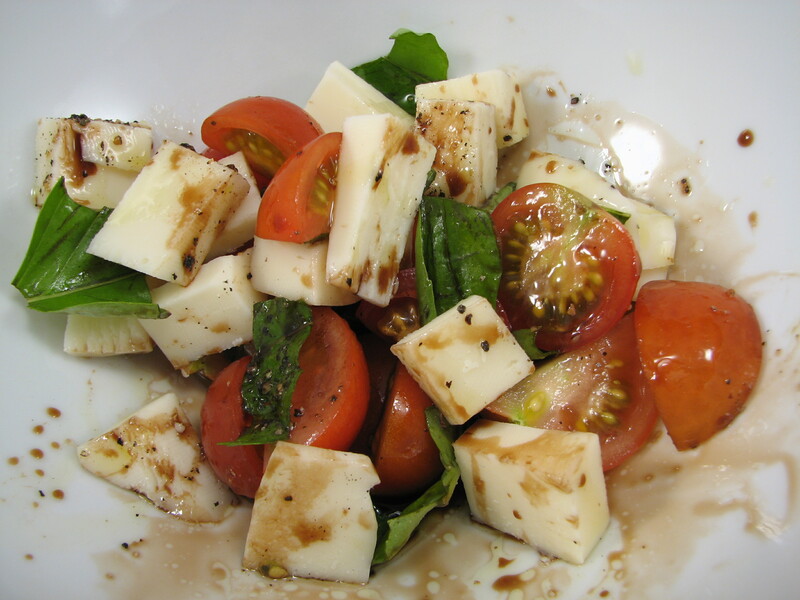 Fresh basil, fresh tomatoes, mozzarella cheese, balsamic and oil. My favorite summer salad. The only reason I say this recipe is “just okay” was because Michael said it wasn’t his favorite that we’ve tried. Usually I call a recipe a winner if we both take a bite and say “WOW this is fantastic” and since we both didn’t agree on it, it’s “just okay.” I liked it but it wasn’t the best mustard sauce I’ve made. QUESTION: What’s your favorite pork recipe? I like running a pork chop through the food processor to make my own ground pork, then mixing it with shiitake mushrooms, green onion, and a splash of liquid aminos or low sodium soy sauce, then grilling it up – voilà, a wonton burger! Oh wow, that sounds delicious!!!! That third recipe sounds really good, do you think it would work with boneless chops instead of a tenderloin? I don’t see why not…we rarely buy meat with bone in it. All of the pork we cook is boneless. I think it would work.